Design a model predictive controller for an inverted pendulum system with an adjustable cart. Demonstrate that the cart can perform a sequence of moves to maneuver from position y=-1.0 to y=0.0 within 6.2 seconds. Verify that v, `\theta`, and q are zero before and after the maneuver. where u is the force applied to the cart, `\epsilon` is m2/(m1+m2), y is the position of the cart, v is the velocity of the cart, `\theta` is the angle of the pendulum relative to the cart, m1=10, m2=1, and q is the rate of angle change. Tune the controller to minimize the use of force applied to the cart either in the forward or reverse direction (i.e. minimize fuel consumed to perform the maneuver). Explain the tuning and the optimal solution with appropriate plots that demonstrate that the solution is optimal. 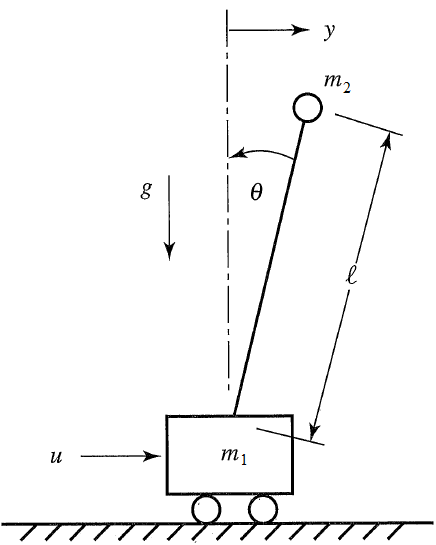 A similar but non-inverted pendulum problem is posted on the course web-site as an example in the introductory section for model predictive control. Thanks to Everton Colling for the animation code in Python. Bryson, A.E., Dynamic Optimization, Addison-Wesley, 1999.